Howard Stern toned down his usual radio schtick, but made no bones about his dislike for Jay Leno during an interview on The Early Show" Tuesday, the morning after Leno returned to his role as host of "The Tonight Show." Asked for his take by co-anchor Harry Smith," Stern launched into a no-holds-barred, blistering attack on Leno. "Just the mere mention of Jay Leno's name makes me want to vomit," Stern said from his studio at Sirius XM Radio, adding that others in show business are afraid to criticize Leno, but he's not. Stern said Leno "seems to be the kind of showbiz animal who won't let go." Noting Leno had worked on "Tonight" 17 years before being "fired" and put in primetime when Conan O'Brien took over, Stern asked Smith, "What would you do, as a man (if you got fired)?" Stern said "a man" would move on to another network and try to beat David Letterman and O'Brien, but Leno stuck around and proceeded to bomb in the 10 p.m. timeslot. 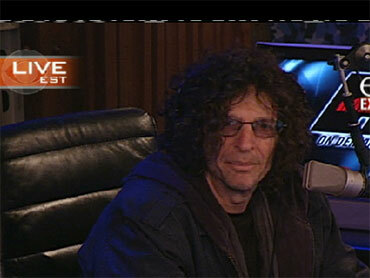 On any possible return by Stern to regular radio, Stern said, "I don't miss free radio at all." And when rumors he might replace Simon Cowell on "American Idol" came up, Stern didn't quash them, saying he wouldn't turn down "100 million" "in this economy." Leno ruled late-night TV until NBC replaced him with O'Brien. Ratings for "Tonight" suffered, and Leno's primetime effort was a ratings disappointment. Letterman grabbed the late-night ratings lead. NBC tried to move Leno back to his old timeslot and O'Brien to midnight, but O'Brien balked, so NBC bought him out and announced Leno's return to "Tonight." But the moves sparked an on-air feud between Leno and O'Brien, with Letterman adding barbs about it, as well. Now, industry insiders are waiting to see whether Leno can reclaim the late-night crown and restore what had been the longtime perception that he was a genuinely nice guy - an image that might have taken some hits during his broadcast squabble with O'Brien.